Flyer must provide entertainment for the reader. Flyer should not require any additional tools not easily accessible (e.g. writing utensil is okay, dice are not). Flyer should be rated PG and be fun regardless of attendee’s pop culture knowledge. Flyer should encourage real-world sharing and interacting with other attendees. I loved quite a few of these ideas and decided to try and combine two of them: Origami and CYOA. This involved a multitude of steps including: graph paper folding, inking, and scanning; digitally re-inking and fixing lines; generating reference images for folding, placing text, labeling lines, and writing text; mapping the flowchart of possible choices; and finally writing three distinct stories. It took a week’s worth of work to complete everything but the stories, and then it was stories, play testing, edits, changes, and story completion. Honestly, it became a much bigger project than I originally intended, but as I’m writing this (2 days before the event) I am hopeful that all of the effort will be worth it. The entire project would drive readers to HeroMuster.com through on-page branding, where they can enter their email address (Call-to-Action) and be able to download all three stories, just in case they couldn’t find someone at the convention. 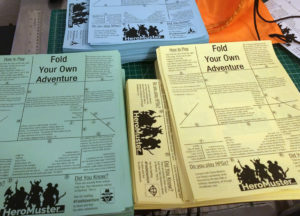 Finally, a hashtag #FoldAdventure was added to the page that has never been used before on Twitter, so attendees could use social media effectively to find others that have a different story (each story is on a different color paper to make this easy). I’m super thankful to all the play testers who took a good idea and made it great by letting me watch how they interacted with the adventures. If they struggled, I made a change. There are 1500 flyers going out at StarFest, and I would estimate less than 15 people (1%) would normally visit the website for a basic flyer, so we’ll see what happens. 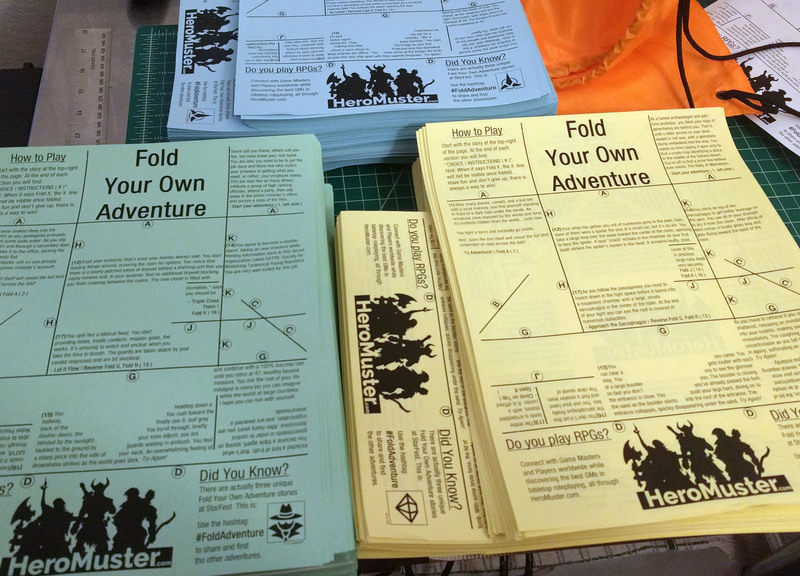 Till then, there is a special Fold Your Own Adventure page on HeroMuster for non-convention attendees to find and try. This entry was posted in Marketing and tagged Fold Your Own Adventure, HeroMuster, StarFest on April 20, 2017 by Mario Lurig.